Define system dynamics and enforce correctness with Parametric and Constraint Blocks. 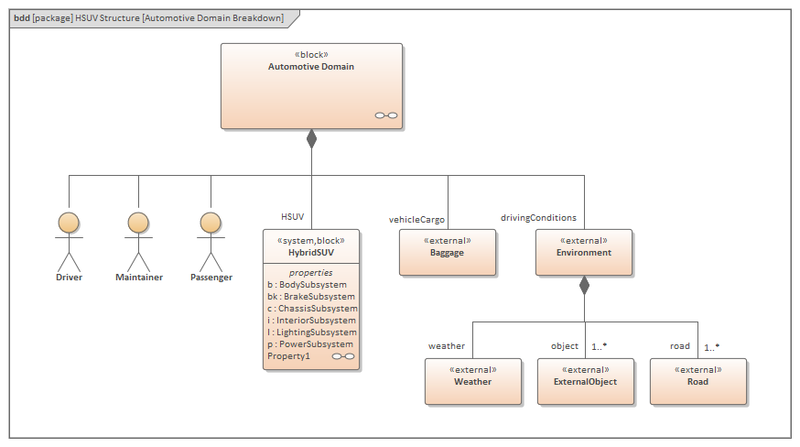 This example SysML Block diagram can be found in the EA Example model under Systems Engineering > SysML 1.5 Example: HSUV > Modeling Domain > HSUV Model > HSUV Structure. Enterprise Architect supports all versions of SysML, from SysML 1.1 to SysML 1.5. Enterprise Architect's support for SysML provides Diagram Toolbox pages for the nine types of SysML diagram, which you can access through the 'Find Toolbox Item' dialog. If you enable SysML as the active technology, you can also open the SysML Toolbox pages by default. See the SysML Toolboxes Help topic. However, SysML 1.5 is virtually identical to SysML 1.4 so the versions are supported and processed as the same thing. You can maintain your models under any of these versions, as necessary, but it is recommended that you only work with one version at a time and disable the others, using the 'MDG Technologies' dialog (select the 'Specialize > Technologies > Manage' ribbon option). You might enable two consecutive versions if you are upgrading your models from the earlier one to the later one. You can migrate a SysML model (or part of a model) to a later SysML version, using the Automation Interface. See the Migrate SysML Model to Later SysML Version Help topic.